The end of the year is my ritual for goal setting for the next year. Typically I spend the previous weeks thinking about how I would like to be different in various areas of my life; family, business, health, and personal growth. On New Year’s Day, I sit down and get down to business. 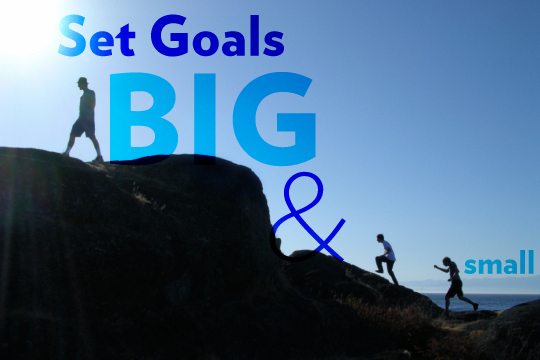 Many people find goal setting an intimidating task. Unless you have a plan for success, even your best intentions may result in spinning your wheels, and your “plan” may backfire, resulting in you avoiding year end goal setting forever. Here’s a simple, yet effective way to set and achieve your goals for the coming year. I’ll admit, that’s an unusual title for someone who has never fired, held, or even seen a gun, but that’s another story! Identify the goal or goals you wish to set. I’ll use myself as an example. As many of you know, my other life is being a soccer and basketball referee. About a year ago, on a cold and snowy morning I was late to my basketball games and did not have time to warm up. After the games, I noticed my right adductor (groin) was tight. I went through the entire season with it getting worse and worse. I received adjustments, massage, and acupuncture, and although it did improve, I was not the 100% that I am accustomed to. I identified my goal – to stretch and strengthen my hip/adductors every morning. The “aim” part is to remove the obstacles that are in the way of you achieving your goal. For me, that meant changing my morning routine. It meant dedicating 15 minutes of my morning EVERY DAY to enact change. Sounds easy on paper, but it may feel different as you go through life. How about those Sunday mornings when I feel like sleeping in? What if your goal is to cut out all sugar? Sounds doable, but the next time you are with friends eating dessert it may not be so easy. I feel the “aim” part of goal setting is THE most important piece. You can identify your goal and you may eventually execute the goal, but unless you REMOVE the barriers that exist in the 6 inches between your ears, you will continue to experience frustration with goal setting. Fire can be the most fun IF you have properly created the “ready”, and have eliminated the barriers to the “aim”. Fire is where you get to play big! Fire is where the metal meets the road. Fire is where you get to realize your dreams. Fire is where TRANSFORMATION HAPPENS! Think about the upside to transforming you. Whether you wish to improve your health, your diet, your exercise program, your hobbies, your friends, your wealth, we are talking about transformation. For any higher brain functional change, studies show you need to repeat that activity every day for 60 days. For me, now 6 months into my morning stretching, I wake each day READY to stretch and strengthen. I add new pieces to my structure every so often and now the 15 minutes become 25. Ready to go? Need some fine tuning? Here’s some helpful hints, courtesy of Lumocity. Lastly, let me know how you’re doing? What’s working and what’s not. I’m always here, cheering you on. Lastly, enjoy yourself this New Year’s, and if you feel this has helped you, please share it with those you know and care for. A tiny habit is easier to stick to. Do you resolve to exercise more often this year? Start with just 10 pushups a day or a short jog around the neighborhood — something so quick that there’s no excuse not to do it. Once a habit begins to feel natural, increase the amount of time or effort you spend. Choose a habit that’s already second nature, then schedule your new habit immediately after. Think about your own days: what existing habits can be extended or transformed? If you’ve resolved to read more, place a book next to your cup of morning coffee. If you intend to brush up on a new language, stick vocabulary cards into your gym bag and take advantage of that post-workout jolt of energy. Existing habits can be a seamless gateway to new activities. You’ll probably need a few nudges before your resolution truly becomes second nature. Create checkpoints to help you stay on track: enlist a friend to keep you honest, set alarms throughout the day, or mark your successes on a calendar. The more regularly you practice your new activity, the more quickly it’ll become a part of your life. ← Have you received your gifts?